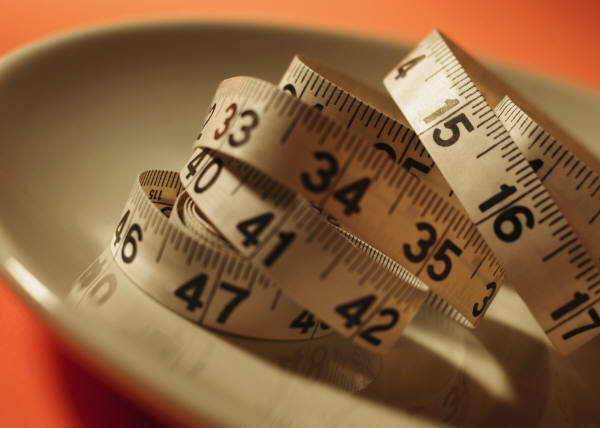 The weight is steadily dropping, and I must remember to measure myself tomorrow. I’ve been reading that the weight loss may slow down, but that the inches could still keep dropping. If I don’t have a baseline, I won’t know how much I’ve lost. Of course, my clothes feel a bit looser, but it’d still be nice to see some actual numbers. Monday was a long and hungry day. I was in meetings all morning at work and didn’t get a chance to warm up my breakfast. By 11 I was quite hungry, but I was fortunate to have taken 6 deviled eggs to work with me and I scarfed them down (3 eggs total). 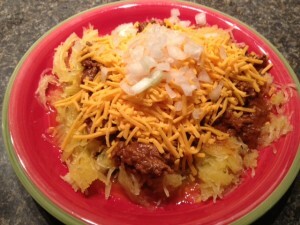 Around 1 pm, I had time to warm up the leftover Cincinnati chili on spaghetti squash. I planned to eat a salad around 4, but didn’t get a chance, and ended up leaving work at 6:30 ravenously hungry. It was trivia night, and I went straight from work to the bar. 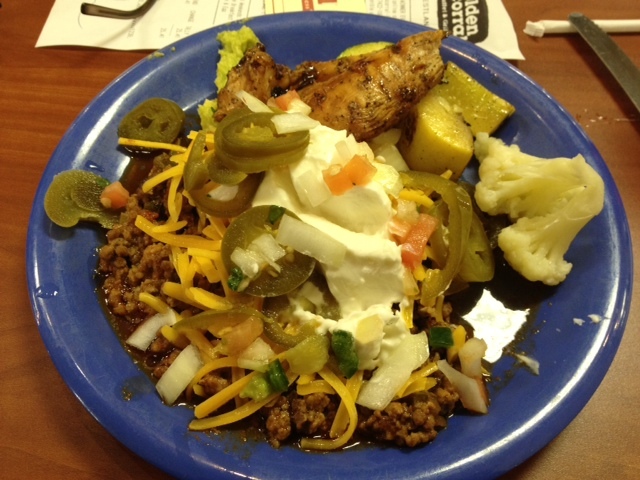 Once there, I ordered a big salad with grilled chicken, cheese and onions. I gave away my croutons and cherry tomatoes. By 10 pm, I was home and hungry again. I had another small bowl of leftover Cincinnati chili and 2 squares of dark chocolate. It was actually the first day that I was really hungry since I began the keto plan. I guess I need to start the day right with my egg and sausage breakfast and be sure to eat my entire lunch. Snacking on bits of food all day left me dissatisfied and wanting more. Since our truck is back in the transmission shop, Rick and I were stranded at home today, and I think we both enjoyed it very much! It was a snowy cold Michigan day, and our NY Times was delivered on time, so we each whipped up a breakfast of choice and hung out with the paper over our meals. I chose to make a 2-egg omelet of cheese and a bit of onion. I topped it with sour cream my son and his fiance picked up for us from Calder’s Dairy. Two breakfast sausage patties completed the meal. I wasn’t hungry for lunch, so I have nothing to report. Dinner was Cincinnati chili experimentation time. As I reported yesterday, I already made the chili part with a pound of ground turkey. All I needed to do today was cook the spaghetti squash. 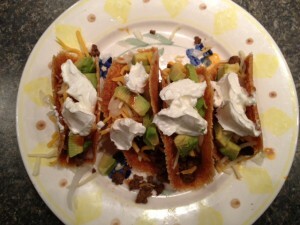 My son Brandon reported that he had a lot of difficulty cutting and cooking his a couple of weeks ago. The last time I made it (for spaghetti alfredo), I had no difficulty with it at all. Well, I guess I was just lucky that time. I used the same process (micro’d one minute before cutting) but I could NOT get my knife to easily divide this squash. Perhaps it has to do with the ripeness? Anyway, after finally severing the squash into about 5 pieces, I put them face down in a dish with 1/2 cup of water. I cooked the squash in the microwave for 6 minutes, then 6 MORE minutes, then 6 MORE minutes. Finally, it was ready to scoop out. I repeated the process with another squash, because I wanted to be sure to have enough to match the huge pot of chili, which would serve us both a few portions in the next couple of days. While waiting for the second squash to cook, I made deviled eggs out of some eggs I had boiled while breakfast was cooking. I’m starting to get the hang of cooking ahead and making more than one meal item at a time. Rick and I each had an egg while waiting for the second squash. 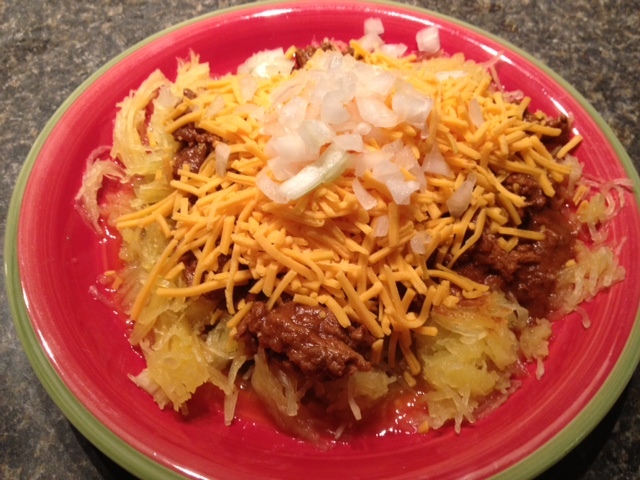 When the squash was all finished, I made us each a traditional plate of Cincinnati chili: 1st layer – spaghetti (squash); 2nd layer – grated cheese; 3rd layer – chopped onions (just a few for me, carbs you know); and….no 4th layer because beans have too many carbs. I am planning to try black soy beans, but haven’t ordered any yet. 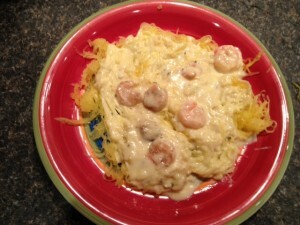 Okay, so it doesn’t look as appetizing on squash as with traditional spaghetti; however, it WAS DELICIOUS! I liked it BETTER than the traditional dish. I think the flavor of the squash blended very well with the rest of the components. This was a hit. And it was very very filling. I couldn’t eat the entire dish, and I can usually plow through one plate and even another small serving. Rick was very full as well. Must be all that great fiber in the squash. Looking forward to leftovers for lunch and for dinner one day this week, as well. Yesterday I worked from home – my day job for 8 hours, then my web business for another three. I had an early breakfast of omelet with cheese and sausage, the took a short break for bbq’d pork rinds and a couple of tbsps of artichoke dip for lunch. Did have time for dinner until I was finished tweaking a web page around 8, but Rick had baked his famous cheesy meatloaf earlier. He adapted the recipe for my keto plan: subbed heavy cream for the milk, used crushed pork rinds instead of bread crumbs, and left off the bbq sauce topping. It was tasty, but not as yummy as his usual recipe. I’m not sure which switched ingredient made it taste more like traditional meatloaf, possibly the lack of bbq sauce. We’ll have to find or make a low carb version to try. For some reason, I wasn’t too hungry for dinner, so I just had a large slice of the meatloaf with a glass of coconut milk. I was really under on my daily carbs/fats, etc. I spent the next couple of hours relaxing and watching Downton Abbey while munching on chocolate mousse and dark chocolate squares dipped in natural peanut butter. Well, the scale isn’t moving. However, I am not discouraged. This diet is the easiest I’ve ever encountered. Rick isn’t even on keto, and he’s scarfing down all the meals with relish! Yesterday began with the usual eggs and sausage at work (prepared by Mr. Palmer’s Kitchen). Lunch was a high fiber wrap with bologna and cheese. After a 2-hour hospital visit, we didn’t get home until 7 p.m. I was second-guessing my plan to make “spaghetti” alfredo. I assumed the whole process would be complicated. It was easy-peezy. The spaghetti squash had microwaving directions printed on a stick-on label….”pre-micro” for one minute to soften a bit, cut in half, scoop out seeds and membranes, put one half in a microwave safe bowl with 1/2 cup water and micro for 12 minutes. While that was cooking, I melted butter in a pan, added 1 cup cream, and reduced a bit. Then I added 1 1/2 cups of Dubliner cheese (we never have Parmesan in the house since we love the pungent Dubliner taste just as well) and some parsley. I could find the basil, so that was that. I whisked that around a bit while 12 shrimp were frying in butter in a small pan on the next burner. 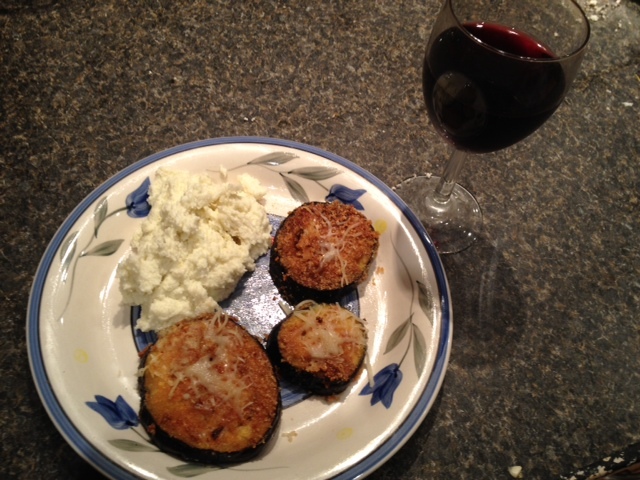 The squash finished cooking, and I scooped out the cooked flesh and fluffed with a fork. I added the shrimp to the alfredo sauce, cooked another minute and poured on top. Voila! 15 minutes tops! And it was delicious! I called Rick in for a taste and he loved it. 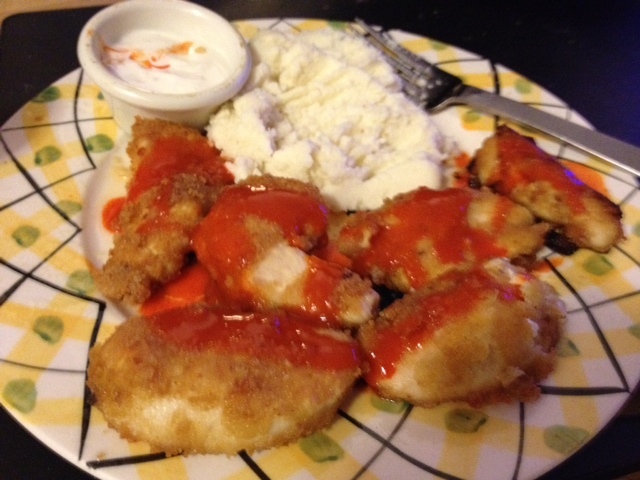 I microwaved the other half of the squash for him, and left him half the sauce, while I scarfed down my portion. Yummy! The moral of the story: the numbers on the scale may be stuck, but I’m eating healthy delicious meals, so I’ll just continue with the keto plan and keep my fingers crossed. Sidenote – my clothes are getting roomier! Hmm. I don’t like this upward trend, but my clothes are getting looser, so I won’t panic. Considering the alternative (going off the plan) isn’t going to make me lose any weight, so I’ll keep plodding along and hope something shakes up the progress. I’m feeling better and coughing less, so maybe I can get more exercise and show more progress. It was back to work for me yesterday. Rick made me my usual morning breakfast sandwich, sans the muffin. 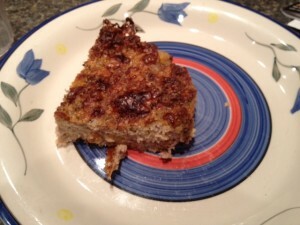 It is really good heated up…all gooey goodness. Lunch was an oddly thrown together wrap. I had intended to take tuna, mayo, and cheese and put it all together in a Flat Out wrap. 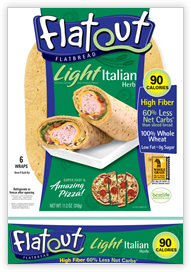 Rick discovered these tasty, high fiber wraps awhile ago. Unfortunately, as I was running out the door, I couldn’t find any tuna fish in the cupboard, so I grabbed bologna instead. At lunch time, I cut a wrap in half, layered it with a piece of bologna, some grated cheese, and a dab of mustard. A minute in the microwave, then rolled it up to make an odd, but tasty sandwich roll. I had a small salad with blue cheese on the side. After a visit with Dad at the hospital (he looks quite a bit better), Rick and I went to trivia. Another salad, and the tops of 3 pieces of pizza, then home for some mousse and strawberries. I’m still running short on carbs each evening. I’m just not hungry enough to eat a lot. I’ll have to plan larger meals. I would normally be disappointed to see no progress on the weight loss, but this huge nearly 10 pound loss has kept me motivated. This is the first diet where I’ve see a big weight loss, so I’ll just keep biding my time and eating right and it’ll come. Yesterday I almost goofed up. Rick and I went to a local diner for breakfast and since I love hollandaise sauce, I ordered the eggs benedict. Rick ordered the breakfast buffet. As soon as the waitress left, I decided I’d better check the carb content, but I was pretty sure I’d read online that the sauce was an okay keto diet choice. Well, the LEAST amount of carbs I could find listed were 6.5. The most said 31 (perhaps with the muffin?). Anyway, thinking about it, I’d end up eating 2 runny eggs with sauce and no muffin, and I don’t even like Canadian bacon! Bad choice all around. Rick caught the waitress on his trip to the buffet and cancelled my order. I hit the buffet and had 2 servings of scrambled eggs, 4 pieces of bacon and 2 pieces of sausage, all for a total of 4 carbs! The exciting part of the meal was that I walked past biscuits and gravy, cakes, hashbrowns, and all sorts of high carb food items and didn’t even blink. I have never experienced any diet like this. I simply do not crave the bread, pasta, and sweets! We spent the day putting a desk together and I had a late afternoon lunch of 2 cheeseburgers, topped with mustard, and a few BBQ pork rinds with spinach dip on the side. By 9 pm, I just wasn’t hungry for dinner. I had a snack of natural peanut butter and 2 70% dark chocolate squares. 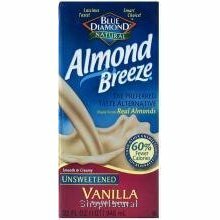 I tried some almond milk (1 net carb) and added 2 drops of sweetener. I think I like it better than the coconut milk, but they are both a nice substitute because I do miss drinking milk. We started our Saturday at the local diner. I had a sausage and cheese omelet and gave Rick my hashbrowns and toast. Lazy day around the house, the off to the hospital to see my dad. Before we knew it, it was 5 pm, we hadn’t had lunch, and were both famished. We decided to go to a buffet, assuming there were enough keto-friendly choices that it would work for me. I’m not craving carbs at all, and it didn’t bother me to pass up the potatoes, fries, cakes, breads, breaded everything that the buffet offered. I settled for taco salad ingredients, minus shell or chips. I threw a few veggies on the side. 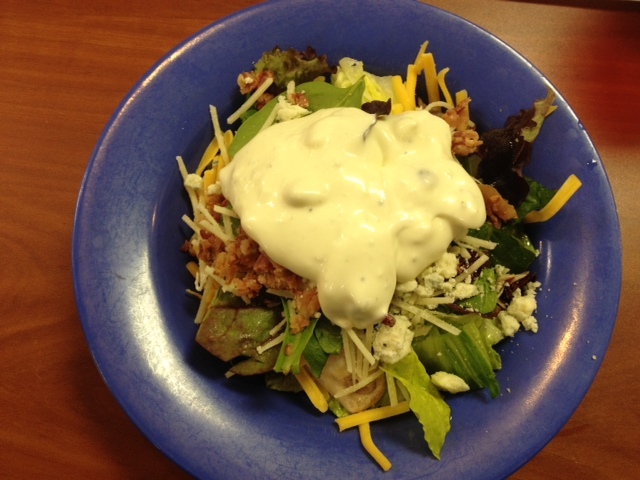 I followed up with a salad topped with blue cheese dressing. We stopped off at Kroger, where I picked up some natural peanut butter, polaner grape jelly, coconut milk, and almond milk. Dessert during the late movie was chocolate mousse with 1/4 cup strawberries.